There is a second floor entrance via front facing steps and a balcony and this opens into the dining, living and kitchen area. 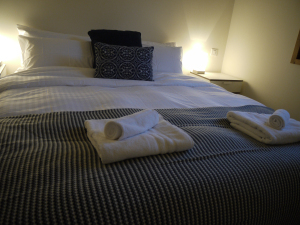 There is also a bedroom with and en-suite, and another shower room and w.c. Upstairs there are three modern bedrooms, one of which is en-suite, and there is a fourth shower room on this level too. On the landing there is also a `snug` area and another television point, so a good place for the kids to go and hide. The apartment is spacious and very comfortable for eight people. It is well equipped with everything you need, plus free wi-fi and English TV. 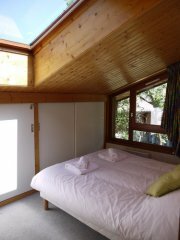 Booking any of our Chalets or Apartments is very easy via our website and you can see all our live prices and availability there too. Many of our properties in Morzine are getting booked up fast so please do get in touch as soon as you can to ensure you don’t miss out! 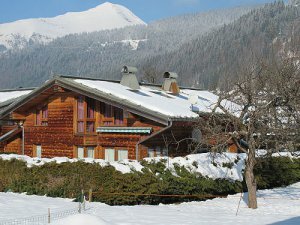 New for Winter 14/15 – Chalet Arthur Apartments, very close to Le Pleney..
Chalet Arthur compromises of three apartments; Pleney, Nyon and Avoriaz. 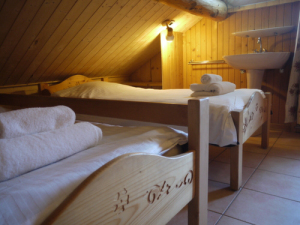 All can be interlinked to provide one big chalet sleeping up to 26 in total, or, just Pleney and Avoriaz can be connected to provide an 18 bed chalet, or likewise, Avoriaz and Nyon can be linked to make a 17 bed chalet. You will receive a 10% reduction in the published price if booking all three apartments together. Chalet Arthur is in a fantastic location right near the base of the new gondola at Le Pleney. This area is the main access to the Morzine and Les Gets ski area. This perfect location means you are minutes away from catching that bubble and getting fresh tracks before anyone else. All the ski schools and the club Piou Piou also meet at the bottom (or top) of this lift. From Pleney you can also catch the little road train which goes directly across the village to the Super Morzine gondola. This provides ski access to Avoriaz and beyond, deeper into the Portes du Soleil. There is also the main ski bus stop a few metres from the apartment. This again provides many options to reach all the key lift stations in the area. 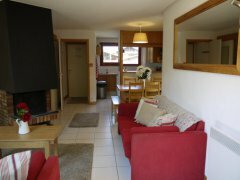 In a perfect location if you are keen skiers and looking for quick and easy access to the Pleney (Morzine/Les Gets) ski area. It is ideal for families with children who need to be at ski school each morning, or of course for groups of friends looking for fresh tracks on those bluebird powder days! 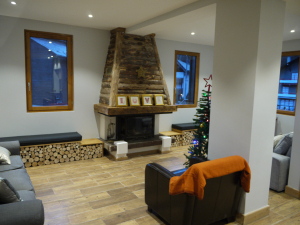 Chalet Pommier is a brand new property for Alptitude-Summer and is located in the most enviable position – just 50m from the village centre and very close to both the Pleney and Super Morzine bubble lifts. The property is set over three floors with five bedrooms sleeping a maximum of ten. It is an ideal property for groups of friends as well as families. Given the wonderful location it is a great property for bikers/activity seekers but also for those who just want to relax in town and enjoy all the other activities that the town and resort have to offer. The property has a galley kitchen which leads out to a dining area with seating for ten people. This leads into a comfortable lounge with an open log fire and large French windows that lead out onto the decked terrace where there is a BBQ and seating/eating area. The five bedrooms are made up of one double, three twin rooms and one bunk room. There are two bathrooms and one separate WC within the property so ideal for those who like a bath as well as a shower after a long day! Large Velux windows in all the rooms of the top floor allow stunning views of Nyon and allow in loads of wonderful natural light. At the property there is a single car parking space however a car is really not needed when staying here. Book an Alptitude transfer from Geneva airport and take the hassle out of your journey! There is also a garage for secure bike storage. This really is the perfect property for those wanting a really convenient and comfortable property. 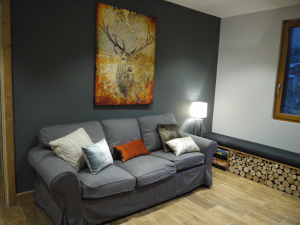 Chalet Pommiers is a brand new property for Alptitude and is located in the most enviable town centre position – located less than 200m from the bottom of the Pleney slopes and just one minute from the town centre. The property is set over three floors with five bedrooms sleeping a maximum of ten. It is an ideal property for groups of friends as well as families. Given the wonderful location it is a great property for very keen skiers but also for those who just want to relax in town and enjoy all the other activities that the town and resort have to offer. The property has a galley kitchen which leads out to a dining area with seating for 10 people. This leads into a comfortable lounge with an open log fire and large french windows that lead out to a decked terrace. The 5 bedrooms are made up of 4 twin bedrooms and 1 bunk room. There are two bathrooms and two separate WCs within the property so ideal for those who like a bath as well as a shower after a long day on the slopes! The top floor of the property has large Velux windows in most of the rooms allowing great views on Nyon and plenty of natural light. There is also a ski boot room for you to store all of your equipment away at the end of the day. All ski areas are easily accessible from the property – the Morzine/Les Gets ski area is just 200m from the front door, and Avoriaz and the Portes de Soleil can be reached by catching the Super Morzine telecabine from the centre of town or catching a bus (nearest bus stop is 50m away). 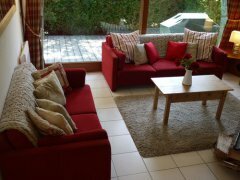 This really is the perfect property for those wanting a perfectly convenient and comfortable chalet.